This 33 page document is a brief introduction to some of the key themes and key points that you need to consider in starting the change process together with an introduction to some of the features and benefits of being a subscriber to this site. Why the astonishingly high 70% failure rate? Want to avoid the 70% failure rate? - Manage the messy stuff, survive and succeed! 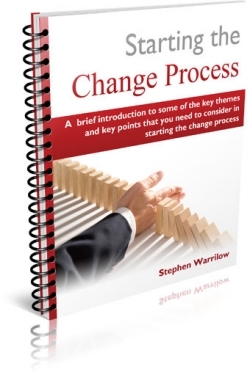 30 page report on "Starting The Change Process"
All of this high quality information is... ABSOLUTELY FREE OF CHARGE! Add your details below and click the button!